Oh man, it was another one of those Hayduke days where so much happened in a day that it felt like three days. Gavin and I had camped at 9,000ft last night and it was windy and dropping into the 30s when I fell asleep. I woke up around 1am to use the bathroom and it was surprisingly silent and calm like I was in a house. Without the wind, it wasn’t too cold and I was pleasantly surprised. The same thing happened this morning. We started hiking just before 7am. I’ve really been enjoying these starts just a bit later than usual. We both mentioned how it wasn’t too cold and once we started hiking, I checked the thermometer…36F, I guess it was cold, but we didn’t realize it as much without the wind. 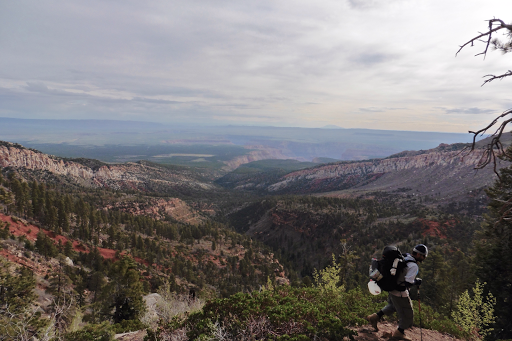 We hiked a couple miles on the forest service road to the Nankoweap Trailhead and Saddle Mtn, where we would drop all morning into the Grand Canyon. 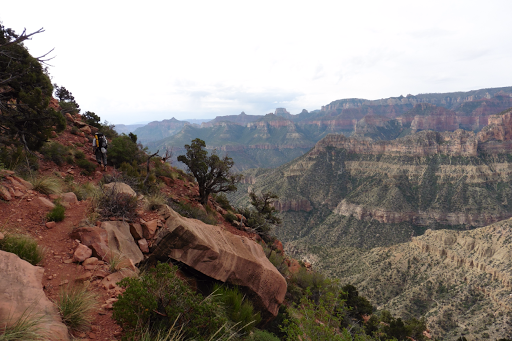 Here I am at the top with my first view looking into the massive and larger than life Grand Canyon. 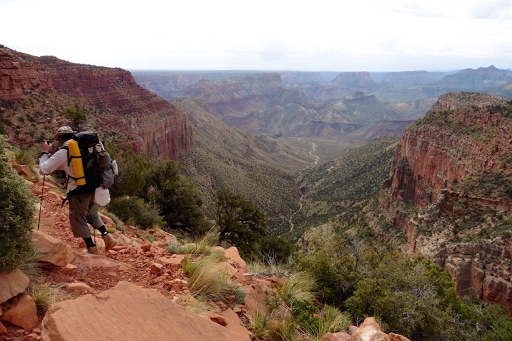 The Nankoweap Trail is noted as one of the most difficult in the Grand Canyon and we were braced for a pretty exhausting downhill. It drops 4,000ft over 6.6mi to Nankoweap Creek(it goes further down to the Colorado River from there and I will elaborate on that later), where we hoped to make it for lunch. We had already dropped to 7500ft by the time we reached the trailhead, so our morning descent over 10mi would be 5500ft. Going from 9000ft to 3500ft. As we began to drop, we got a view looking back. This is a view of Marble Canyon, which is part of the Grand Canyon, and the view we saw from Vermilion Cliffs. Far off on the horizon on the left are the Vermilion Cliffs where we descended down the crack. That elevation drop is quite a change, and normally, it would also result in a smack of intensely hot temps down in the Grand Canyon. I cannot believe our fortunate timing that a cooler front has been moving through that also has cloudy skies to block the intensity of the sun. I’ve heard horror stories of insanely hot temps in the Grand Canyon and am thankful to not have that happening this leg! 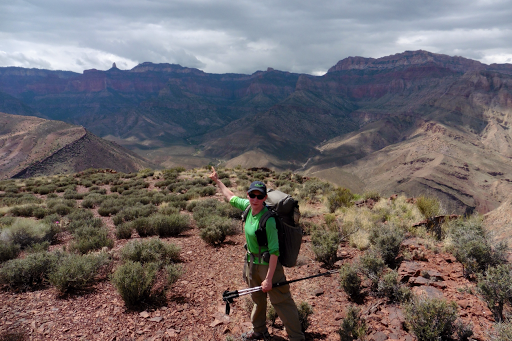 Given the conditions and our low expectations, we both really enjoyed the Nankoweap Trail and it was the perfect introduction to the Grand Canyon! It mostly traversed as it consistently dropped while providing one surreal view after another. Helicopter tours flew by all morning and that was a bit disappointing. The trail was great, but it did have unforgiving desert foliage along the trail, and Gavin had a pocket on his pant leg snag and completely tear open. He also bumped into some brush and lost his empty Gatorade bottle that was bungeed to his pack. He was pretty bummed since he used it for Gatorade drink mixes he won’t put in his water bladders and it was the wide mouth he needed for his SteriPen to sterilize his water. As you’ll see, it wasn’t his best day. I was really glad that the trail was made in a way that the hiker can take the view in rather than constantly looking down for footing. It wasn’t completely smooth, but it also wasn’t too rugged to not look up. It took us 3.5hrs to do the 6.6mi descent, which is pretty fast, but we know that is under the most ideal weather conditions. Those planning a hike down this trail should not use that as realistic time to make it to Nankoweap Creek. 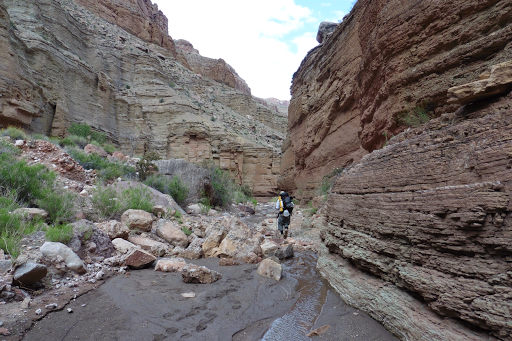 We traversed along the ledges as it wove in and out of canyons and gradually went down toward the Colorado River. I took tons of photos as we traversed down. 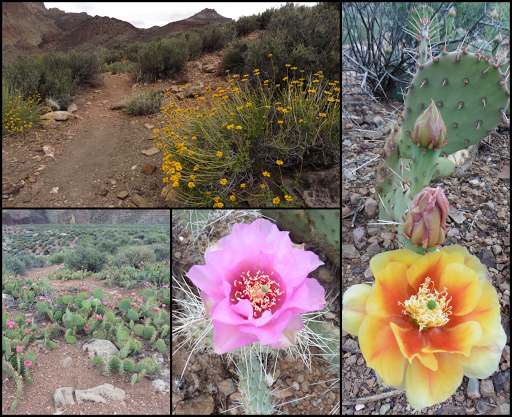 As the trail leveled out near Nankoweap Creek, there were tons of cacti in bloom. It was like walking through a desert garden. I had to be careful not to get too distracted by the pretty blooms because the cacti were also hanging over the trail and very easy to bump into. We had lunch at the creek and there were many other backpackers around. Also, rafters that hiked up from the Colorado in search of spring water. I’m going to show you a map to orient you to the choices from Nankoweap Trail. This map is from Li Brannfors’ mapset, which I really like. It’s the same as the Skurka bundle maps for the Hayduke, but with mileages, notes, and alternate suggestions noted directly on the maps. If you look on the map, the official Hayduke is in red and the alternates are in purple. We left from lunch at Nankoweap Creek in the upper left hand corner. In originally planning with Katherine, the Horsetheif Alt was one of the alternates she wanted to do as it was recommended by Li. I didn’t think much about it and have always assumed it would be enjoyable. The only red flag about it was that Katherine and I met a couple about a month ago that had done the route and commented that it was one they didn’t need to do again, ha! The ranger I’d spoken to mentioned that the first view is worth seeing and that I could do the first climb and then have the option to bail down Kwagunt Creek if I wanted to switch over to the official trail “bushwhack” along the river instead. We did the 2.9mi option, and to give you an idea of how tiring it was, it took us 2.5hrs to do those 2.9mi. Very slow going and not as rewarding as we had hoped. It was a 1500ft gain cross country up a drainage fairly steeply and and then 1500ft right back down again…there were views, but nothing much different from what we had been seeing all day and we couldn’t take them in with the exertion and careful footing involved. Here is a view up top, of Saddle Mountain (middle left), where we descended from just this morning. 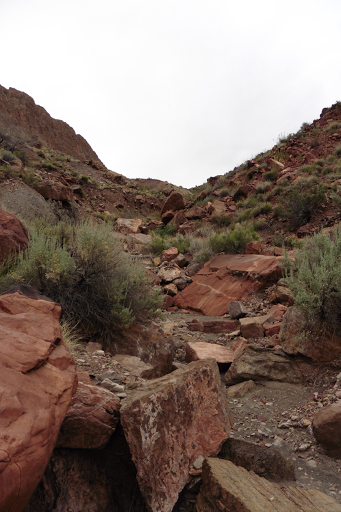 The whole route is cross country on very loose rocky terrain while dodging sage brush and cacti. I got ahead of Gavin on the descent and waited at the bottom for him. The last part had at least turned into a wash that was somewhat enjoyable with better footing. Poor Gavin was completely spent by the day by the time he got down to where I was. Also, at the top, where there were tons of loose rock and cacti in grass, he said he had slipped on a rock, and to avoid landing on cacti, had an awkward tumbled fall. So not his day. There was still 10mi left on the Horsethief Route and we discussed the pros/cons of this suffer fest. At the end of those 10mi, we would need to hitch across the Colorado, and that is recommended for early in the day. There was no way we’d make it at a good hitching time tomorrow at this pace. We were doing this route in ideal conditions with cool weather, a breeze, and clouds to block the sun and still dripping sweat. 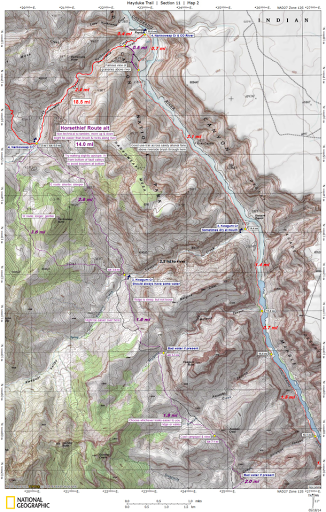 In theory, this route could be 1mi/hr with no more good water sources. That means carrying a lot more weight in water. The elevation of loss/gain of the next three miles was the same of what we’d done. 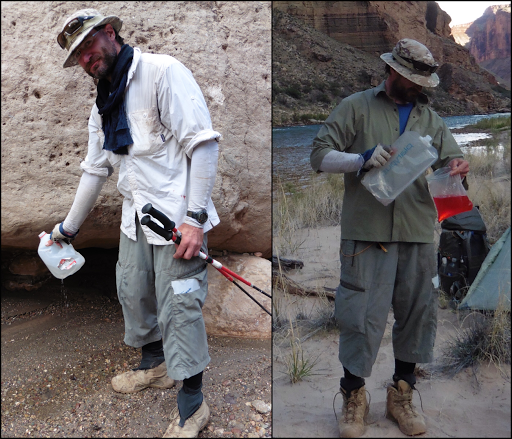 We were 2.3mi from the Colorado River, and another 5mi from the hitching point from there. We decided we’d had enough punishment for one day. We bailed on the Horsetheif Alternate. I feel like I got the experience of it and the effort outweighed the reward on this one. 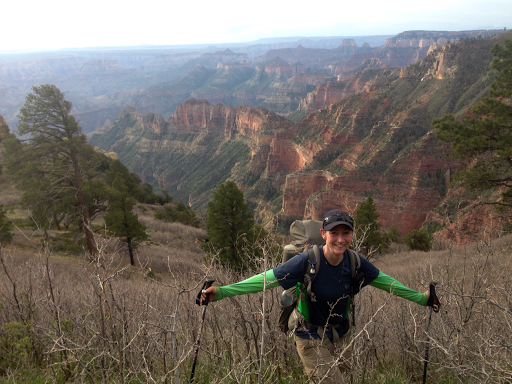 It’s my first time in the Grand Canyon and I’m happy to hike along some brush on the Colorado River for 5mi tomorrow. Gavin completely agreed and had been a good sport about trying this alternate that was never on his plan to begin with. We hiked 2.3mi down the beautifully relaxing Kwagunt Creek. It was a great part of the day to just take it all in and relax in calm and quiet. To cap off Gavin’s unfortunate day of tearing his pants, losing his favorite water bottle, and having a fall, when he went to grab water with his gallon jug that hangs off his pack, he found out the jug had gotten punctured on the fall and now spurts water out the bottom, so it’s useless. He handled it well, but man, what a rough day for him. He loves Gatorade and couldn’t have any all day once he lost his bottle, so he made some in a Ziploc at camp once we got there. 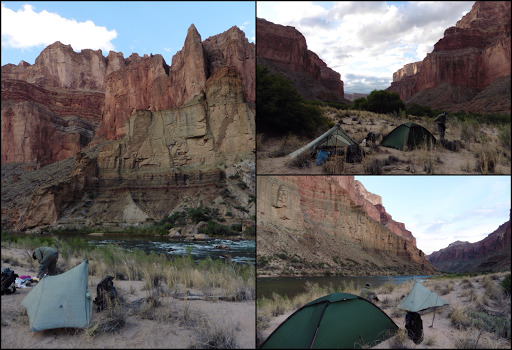 We hit the Colorado River about 6:30pm and setup camp on the beach near the Kwagunt Rapids. It was 70F with a nice breeze and wonderful scenery in all directions. We were quite pleased with our choice to return to the original Hayduke route. This is my best campsite of the entire trail! I’m really relaxed and it’s enjoyable and calm. I took multiple camp photos. I haven’t been sleeping well and the sound of the rapids is just the white noise I love to have as I sleep. Temps are perfect and I even get to wear my clean Tshirt to bed and sleep with my sleeping bag as a blanket. Man, what a day! I’m a tired, happy camper! 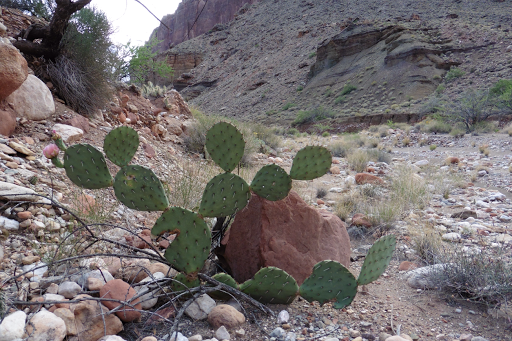 Bonus photo…the rare Mickey Mouse cactus!